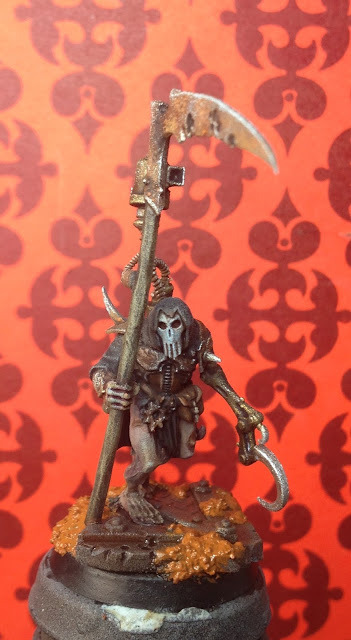 The reaper-cultist of Mhorrigot is nearing completion. Unfortunately the sprays came on a bit too thick, creating a very textured surface that didn't lend itself to any advanced paintjobs. So this one was done in a very muted almost monochromatic paint scheme. Lots of drybrushing and then washes to create different hues. Very nice, I think the slightly muted colours are working to strengthen the sinister look of the figure. I really like how the rusted blade is looking and the hook arm has a kind of oily look to it that is interesting. Thanks! The texture does work wery well on the rusty parts. I like his look also, very subdued, stripped of all joy and life. How do you do your basecoats? Is it via an airbrush, or via a spray can? I know I have gotten similar effects, when using a can, which I think was because I had held it too far from the miniature and the paint partially dried before hitting the model. I would like to start getting into airbrushing, but it seems like an daunting and expensive prospect. Thats probably what happened. I gave him a coat of GW chaos black, followed by a light spray of army painter leather brown. Then a light dusting of their uniform grey from a distance - that's when the texture effect appeared. The metalwork looks excellent, there's 'texture' to the scythe and armour plates, wether intended or not its certainty a nice effect. I was wondering what colours you would use to define your gods followers and demons, the grey certainly seems heartless and soulless. The background image really adds to the image, have you considered doing a 'wallpaper' with the Mhorrigot symbols to link all your future shots together?